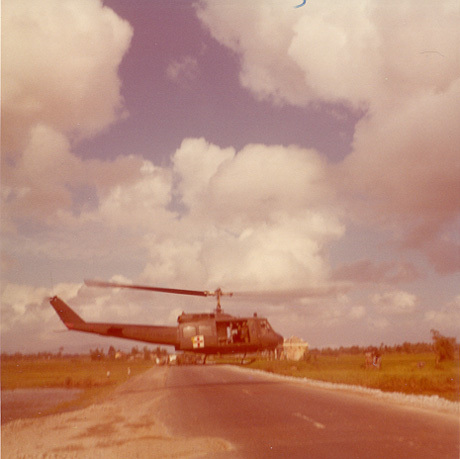 A medevac Huey, probably from the 236th Medical Detachment, lifts off after picking up a civilian casualty from CAP 2-7-2. This happened on Highway 1 in late summer of 1970. As I recall the woman was peppered with shrapnel from a booby trap and her family brought her to CAP 2 for treatment. Doc Doggett gave first aid and we called for a medevac chopper. Civilian casualties were usually taken to the Army’s 95th Evacuation Hospital in Da Nang.